Watching The Crown last night on Netflix, I was reminded of the impact newspapers used to have on our daily lives, particularly before the advent of television in the late 50’s. For many people, the daily paper was their only way of discovering the news, with the transistor radio playing its part of course, but picking up your favourite newspaper on the way to work for the morning commute became an unavoidable ritual. Let’s face it, a large broadsheet acts as a wonderful wall to hide behind when you’re still waking up on the 7:15 to Grand Central or wherever you’re headed for that daily nine-to-five. 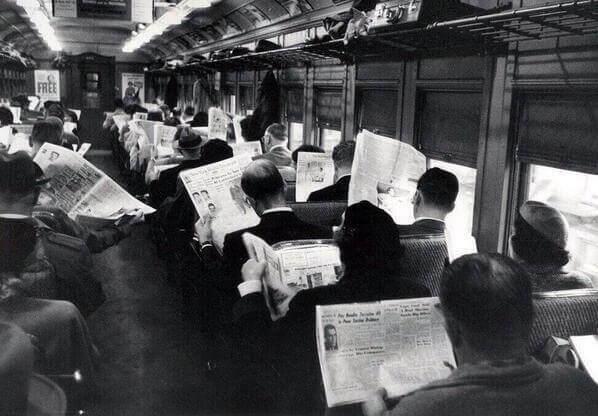 But today, people absorb themselves in tablets and mobile mobile phones which offer a vast and instant choice of entertainment on demand that real newspapers can’t possibly compete with. Also, it’s often said that the smartphone has replaced conversation. Well, so did newspapers actually, on the commute at least. Try disturbing that commodities broker on the 7:15 and you’d have gotten short thrift, that’s for sure. The last time I bought a newspaper was likely about seven or so years ago when the English Buenos Aires Herald (now defunct) was still worth a read, but as the quality of its content went down the toilet when it was bought by an ultra-socialist and corrupt millionaire, I kicked it into touch. But the overriding factor is that all the news you’ll ever need is now on the net, fake or otherwise. My 81 year old mother-in-law still has her daily paper delivered, in spite of her ability to use a PC, which I then recycle for lighting barbecues or using in paint jobs. The Sunday editions will suffice for at least five barbecues or maybe more, by the way, and it’s also worth noting that the Sunday magazine is not a good fire-starter and should be reserved for packing your china, silverware and crystal items. 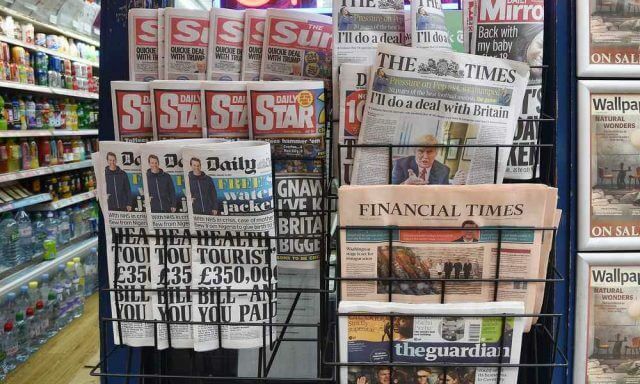 In October 2003, the combined circulation of Britain’s four quality daily newspapers was 2,173,248. In October 2006, the combined circulation of Britain’s four quality daily newspapers was 2,198,449. That’s an interesting statistic from 2006 and the remarkable fact is that the daily figure of around 2 million print readers in the UK is still roughly the same, bolstered in large part by free newspapers, particularly Metro which is read by an estimated 14 million readers every month. Some say this is because of its unbiased and politically neutral stance, not to mention its free distribution at busy commuter choke points. Has the Internet Killed Newspapers? From the statistics mentioned above, clearly not, but many of the world’s media groups have indeed moved with the times purely out of necessity and they’ve now become multimedia groups, which is not a word one normally associated with a daily newspaper back in the day. The Independent (a UK newspaper) on the other hand, ceased its print version and went entirely digital in March 2016– a bold move by anyone’s reckoning — yet a move that establishes a clear identity, even if it is simply a click-bait portal. What you get with a printed newspaper is a lot, but it’s limited to what’s current at the time of printing and before the Internet came along, you needed to get your story update from the TV or radio. An added bonus was that you’d also end up with black ink all over your hands and invariably six foot piles of unread Sunday supplements and sports pages cluttering up your living room or man shed, prompting no end of nagging from she who must be obeyed. I don’t know about you, but I’ve become accustomed to free news on the net, in spite of the fact that I didn’t mind putting my hand in my pocket to by an actual printed newspaper in the past. But now, with media groups feeling the pinch, many online news services are putting up paywalls, which at first glance can be a little off-putting, until you see the prices. The Daily Telegraph print edition for example, costs £1.60, with the Saturday edition costing £2.00. Compare that with their online subscription costs of £1 per week for one year, then £2 per week thereafter and you’ll soon stop moaning. Their free, registered edition allows you a measly one article per week, although I seem to manage an almost unlimited amount of reading without doing anything special, but please don’t tell anyone. It’s also worth mentioning that the tabloid rags such as The Mail, The Sun, The Mirror, et al (and I dare say The National Inquirer and others of that ilk in the US), don’t seem to give a monkey’s whether you register or subscribe, as long as you click on the cleavages and click-bait headlines. Fair enough then. The Washington Post, The New York Times and CNN, (which, strictly speaking is not a newspaper) don’t appear to have paywalls in place, although they do offer a subscription service which fortunately they don’t ram down your throat, so I’m happy to browse away until such time as they get tired of my freebie habit. It must be a fine line to tread for a newspaper publisher though. That is, deciding on how to manage their paywalls, whether to implement them in the first place and juggling that subscription income over and/or including advertising revenue. The Guardian doesn’t put up a paywall, but simply asks for a donation, explaining that advertising revenue is falling, which kind of prompts one to turn off that adblocker doesn’t it? In fact, why not turn off your ad-blocker on ALL the useful sites you visit? But times have changed drastically and when you bought that daily paper or magazine, you expected it to be brimming with advertisements and if you didn’t like them, you turned the page or just ignored them. Online advertising however is practically Orwellian; it follows you wherever you go, knows your habits and targets you like an Exocet missile, unless you’ve locked down your privacy settings, which most people haven’t because they either don’t know how to, or simply don’t care. Either way, it seems newspapers and technology have found a kind of working synergy, a harmony if you like, and it doesn’t seem like printed news is going anywhere in a hurry. Given the choice though, unless I’ve run out of kindling for my weekend barbecue, I’d rather play with a smartphone on my travels and access stuff on demand. HNY Marc. I still truly enjoy reading the print format as the online is often more of a pain. It’s the format most online papers use, forcing users to adjust their style. Prefer to purchase the paper whenever a free issue is unavaliable. As for paying an online fee to get news, that is a joke, right. News is meant to be free and shared. There are plenty of medias to obtain information. Those charging a monthly fee should give users a free 30 day trial, so that only those satisfied with the content will accept the terms. Anything else is bad form, Mindblower! News was never mean to be free Mindblower and the point I was making in the article is that we are perfectly happy to buy a printed newspaper, but not necessarily pay for that news online. It’s just that we’ve become accustomed to the online freebies. Media companies have to make money too you know. Take DCT for example; all the content is free, supported by ads, yet if you went out and looked for a daily with this much tech information in it, you’d probably have to pay for it as a printed edition. Marc replied “but not necessarily pay for that news online.” Radio and TV live or online dealing with news is free, since there are ads to cover the cost. Local newspapers which are still given away for free are and have been covered by advertising. I can speak for two provinces here in Canada where this policy still exists, Quebec and Ontario. Thought I made myself clear that those wanting to subscribe for online content should be given a grace period to see if they are satisfied prior to paying. One important factor often overlooked is that a money back policy only applies if one lives within that country – as the exchange rate can be a killer. I do not know who much longer the print version of many large outlets will continue as the costs are a mounting, Mindblower! We still get a daily paper delivered to read with coffee in the morning. By the time I read the paper I’ve already seen most of the world/national news online but for local news the daily paper can’t be beat. The ads in a newspaper can be easily ignored as you mentioned, but the local ads are actually of some interest and I pay some attention to them. Online news sources are usually interspersed with click-bait and ads for things I don’t care about or, thanks to tracking, things I’ve already purchased. It’s somewhat amusing to see that Amazon is serving me an ad for an item I already bought from them a week ago. The paper also has certain daily and weekly features that I’d have to search for online. When traveling I read their online edition which is available in two versions. One is a typical web page but the one I prefer is an app with a split screen with the actual newspaper page on the left and a window on the right to that opens to an article clicked on. 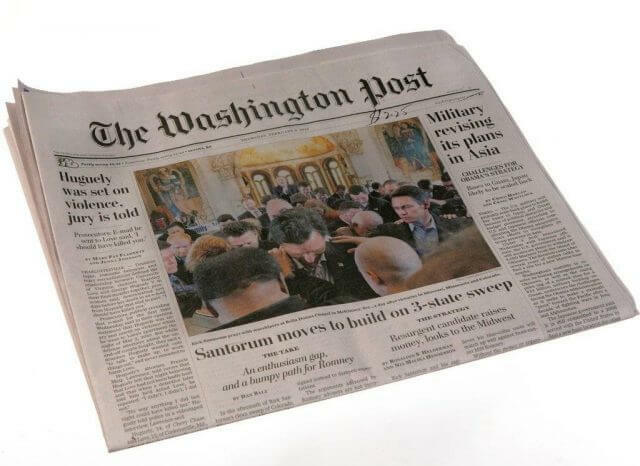 Still prefer the broadsheet… and it’s a reliable source of packing material. USA Today sometimes nags to sign up. The major newspapers (New York Times, Washington Post, LA Times and Boston Globe to name a few) allow a limited number of articles to be read before raising the pay wall. Leastways, that’s what happens for us in the United States of Anarchy. Local papers are dying rapidly here. And cable companies make it difficult to catch local television stations for cord cutters. My ISP is limited to Comcast and guess who owns NBC? So, finding news stories from reputable sources for free can be like running a maze. We have a paid subscription, and our local newspaper is delivered at home everyday. My wife reads a lot more online news than I do, but she still won’t let me stop the paper delivery. Old habits die hard I guess. Thanks for your interesting comments Richard.